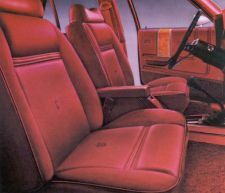 To the GMV spotter, an ESS can most easily be identified by the ESS badging on the front fenders, the blacked-out exterior trim, special ESS headrests, and an interior trim code (on the Ford Dataplate located on the driver’s door) starting with "P" denoting "Performance Bucket Seats." 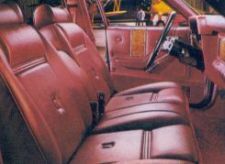 Although no other 1978-80 Monarch has such a trim code, it should be noted, however, that not all ESS Monarchs were equipped with the Performance Bucket Seats and therefore, may have a different trim code. EXCITING NEW MONARCH ESS OPTION - Those who appreciate the flavor and flair of European styling will want to order Monarch with its new ESS option. Its distinctive features have a resemblance to some expensive European sedans. The Monarch ESS option includes refinements that reflect a striking look of distinctive elegance. Blackout vertical grille. Black bodyside moldings with bright inserts. Black window frames. Black hood and deck-lid paint stripes. Black rocker panel treatment and lower back appliques in black and argent. But its striking appearance is just the beginning. The Monarch ESS is built to enjoy. It is equipped with a heavy-duty performance suspension - heavy-duty front and rear shock absorbers, and heavy-duty rear springs. Pictures of Monarch ESS models may be found within the album on the Granada ESS Page. 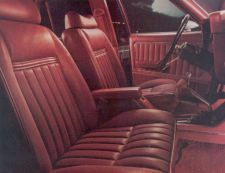 They will also be found on on the 1978-80 Monarch pages.